The College of Wooster women’s basketball team rallied from 13 points behind in the second half, pulling off a stunning comeback victory at Ohio Wesleyan University on Saturday. The Fighting Scots trailed 46-33 with 5:27 left in the third quarter, but went on a furious 19-6 run to take the lead. After the teams went back and forth for several minutes, Wooster edged the Bishops in overtime for a hard-fought 82-80 win. “I think we played really well as a team, and we stuck together while we were down, which was really crucial in coming back and winning after being down 13 points,” said Akwia Tilton ’20. Anna Gibbs ’19 was Wooster’s top scorer, leading both teams with 27 points. Kyle Croxton ’19 turned in a strong performance with 17 on the board, while Tilton and Sarah Rapacz ’21 put up 11 each. Rapacz led the Scots with nine rebounds, while Aubri McKoy ’20 had seven. Four different players scored in double digits for Ohio Wesleyan, as Claire Sterling ’20, Devin Hefner ’22, Meghann Dunning ’20 and Leah Maniaci ’22 each put up at least 12. Sterling led all players with 14 rebounds, and Cierra Joiner ’22 added nine. The Scots got off to a hot start, jumping out to an early 7-0 lead thanks to Gibbs and Rapacz. They held this lead for the first quarter, finishing with a 21-15 edge. Ohio Wesleyan clawed back and tied it at 24 on a three-pointer by Hefner. The Bishops stayed hot with a three from Dunning and another by Hefner, and they took a 39-30 edge into halftime. Ohio Wesleyan continued building the lead, which reached its high point of 13 midway through the third quarter. Wooster chipped away with free throws by Tilton and McKoy, then Gibbs cut the lead to eight with a three-pointer. Maniaci got these points back with a three of her own, but Croxton responded with two more shots from behind the arc, making it 49-44. After Rapacz and Wesleyan’s Erin Delaney ’19 traded layups, Marion and Gibbs scored for Wooster to make it a one-point game at the end of the third quarter. Early in the fourth, Tilton completed the comeback with a layup that gave Wooster a short-lived 52-51 lead. The Scots would need even more comeback magic in the final minute, and they got it when Marion knocked down a three to tie the score at 71 with 33 seconds remaining. After the Bishops regained the lead, Rapacz’s layup with eight seconds left retied it and forced overtime. 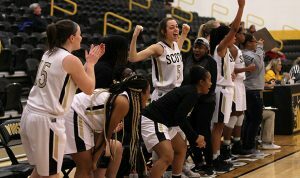 Early in the overtime period, Gibbs and Tilton combined to sink three free throws, which gave the Scots a lead they would not surrender. Gibbs made four more free throws in overtime to help Wooster secure the final result. The women’s basketball team will host Wittenberg University at Timken Gymnasium on Saturday, Feb. 9 at 2:00 p.m.